The ES30 is supplied with a small hook, medium hook, and 2" diameter compression plate. The ES30 Force Measurement Test Stand is a versatile and economical solution for most compression and tensile testing applications. It can accept a wide variety of sample shapes and sizes and can be configured in many positions due to modular design. 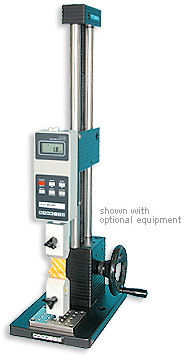 Precision hand wheel operation enables the user to easily and accurately test up to 200 lb of force. Use the ES30 with any Mark-10 force gauge and grips to create a complete testing solution.